They were the first to brave the unknown. In the late 1940s, the notion of space travel lived squarely in the realm of science fiction. But a young Army doctor named John Paul Stapp saw no limit to how far mankind could go—he had his eyes set on the heavens. By the 1950s and early '60s, a small band of high-altitude pioneers exposed themselves to the extreme forces of space, long before NASA's acclaimed Mercury 7 would make headlines. With a fraction of NASA’s budget and none of its renown, Stapp's Project Excelsior would send Captain Joseph Kittinger to a record-breaking 102,800 feet above Earth, lifted not by rocket, but by balloon. 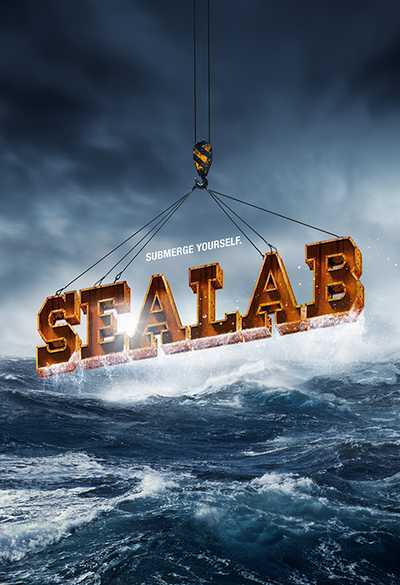 Though largely forgotten, this group of daring explorers would be the first to venture into the frozen vacuum on the edge of our world, testing the very limits of human physiology and ingenuity in this deadly realm. Narrator: In the spring of 1959, the National Aeronautics and Space Association, NASA, introduced Americans to a new kind of hero -- the astronaut. Known as the Mercury 7, their mission was to rocket beyond the earth's atmosphere, and they quickly became a national sensation. In the months that followed their faces blanketed the news, as the country waited to see who would become the first man in space. But far from the Project Mercury spotlight, deep in the New Mexico desert, the Air Force was also preparing to launch a man towards the heavens. 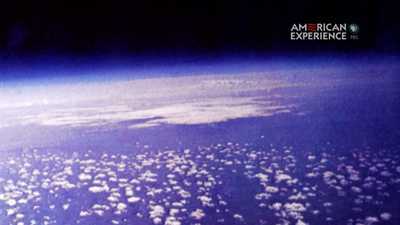 With a fraction of NASA's budget and none of its renown, Project Excelsior was about to send Captain Joseph Kittinger 100,000 feet above the Earth, and he would get there not by rocket, but by balloon. It was the culmination of over a decade of little-known aerospace experiments, and this would be the most dangerous of them all. Craig Ryan, Writer, : There were a myriad of problems with sending a person up to that altitude. Could you keep them warm? Would they be exposed to dangerous radiation? How do you give them a safe breathable atmosphere? Burkhard Bilger, Writer: Above 60,000 feet, you've got so little pressure that your blood can boil. Organs can rupture, blood vessels can rupture. The temperature is a hundred degrees below zero. There are just so many things that can wrong. Gregory Kennedy, Aerospace Historian: At 100,000 feet you're above 99 percent of the earth's atmosphere, so you might as well be in space. Narrator: Though largely forgotten, balloonists would be the first to venture into the frozen vacuum on the edge of our world, exploring the very limits of human physiology and human ingenuity in this deadly realm. Ken Hollings, Writer : Flying in a balloon to the upper reaches of the atmosphere, perhaps seems odd, eccentric, even self-inflicted madness. But there's no question that these experiments fed into what NASA was about to undertake with Mercury. They answered a lot of questions. They answered a lot of big questions. Craig Ryan, Writer: At 102,800 feet, higher than any human being has ever been in a balloon at this point, Joe Kittinger gets a signal from his ground crew. He stands up in the gondola, disconnects his onboard oxygen supply, says a little prayer, and steps off. Narrator: In April, 1947 a young army doctor was transferred to a remote airfield 100 miles north of Los Angeles, which would soon be named Edwards Air Force Base. John Paul Stapp was a maverick in the bourgeoning field of aviation medicine and Edwards was just the place to be. Only months after Stapp's arrival, test pilot, Chuck Yeager, broke the sound barrier in the rocket-powered X-1. His accomplishment marked the beginning of a new era that would push the limits of man and machine. Ken Hollings, Writer: Aerospace as a concept, the idea of getting a man high up into the atmosphere and beyond, was still relatively new. And doctors were aware that the human body, although robust and neatly packaged, does have its limits. Francis French, Aerospace Historian : John Stapp was watching jets go higher and faster and realized that scientists and doctors had no idea really what would happen to the human body as it was subjected to faster forces and higher altitudes than ever before. Burkhard Bilger, Writer : And so Stapp decides to investigate what the human body can handle. How much speed we can handle, how much falling we can handle, how much altitude we can handle. And he starts to unpack this little by little. Narrator: Stapp explored pilot ejection seats, liquid oxygen breathing systems, tested the impact of windblast, and subjected a succession of Air Force personnel to all manner of experimental contortions. But he spent the most time studying G-force limits: how the intense acceleration and deceleration, encountered in a rocket or high-speed jet, affected the human body. The military maintained that any force beyond 18Gs -- or 18 times the pull of gravity -- would be fatal. Stapp helped design a series of faster and faster rocket sleds, to challenge that assumption. Craig Ryan, Writer: Imagine a soapbox racer made of aluminum on a railroad track with rockets on the back of it. Which would be fired down the track and then slammed to a stop in just a few seconds. Narrator: Stapp rode the sleds himself, each time ramping up the speed and the G-force pressing on his body. He cracked ribs, lost six fillings and broke both of his wrists. "I prefer to take the physical punishment personally," he told one observer, "rather than risk the court-martial for killing some unlucky sergeant." Dana Kilanowski, Aviation Historian: He got up to over 300 miles an hour and pulled 38 Gs. And when he told his superiors that he had survived 38 Gs they told him to cease and desist immediately. Craig Ryan, Writer: Stapp used to say, "I always follow orders when they make sense." And he always pushed it a little farther than his superiors were comfortable with. Narrator: On December 10th, 1954, Stapp took his experiment to it's extreme. Craig Ryan, Writer: There were nine rocket engines on the back of that sled. And when they fired, Stapp said that he lost all orientation as he shot down this track in excess of 630 miles per hour. At the end of the track, Stapp slammed to a full stop in 1.35 seconds. Gregory Kennedy, Aerospace Historian: It was the equivalent to ejecting from an airplane at 30,000 feet. And he was out to prove that a pilot could do that in an ejection seat and survive. Dana Kilanowski, Aviation Historian: The most serious thing that happened was the hemorrhaging into his retinas. He got out of the rocket sled, he thought he was permanently blind. Gregory Kennedy, Aerospace Historian: He was taken to the base hospital where gradually his vision came back. He had two black eyes, but other than that, he was fine. Narrator: John Paul Stapp had set an almost inconceivable G-force record of 46.2 and was heralded as "The Fastest Man on Earth." Burkhard Bilger, Writer : What's wonderful about Stapp is that he's not just a daredevil. He is an explorer in, in the sense that he never is satisfied. There's always the next frontier that he wants to go to. Col. Joseph Kittinger, United States Air Force: I was stationed at Holloman Air Force Base and I was in the fighter test section. And one day our boss called all the test pilots into a room and he said, gentlemen, we're going into space. Dr. Stapp has a space program and he's looking for a volunteer. And when he said that, there was a lot of laughter, because space was something that Buck Rodgers did. Pilots were not gonna go into space. But, I always thought that anytime anything new that's never been done before is exciting. So, I immediately put my hand up. Narrator: John Paul Stapp had been promoted to Chief of the Aeromedical Field Laboratory at Holloman Air Force Base in New Mexico. He needed Captain Joseph Kittinger to help conduct a series of zero-gravity experiments, testing the reaction of the human body to weightlessness. Gregory Kennedy, Aerospace Historian: Dr. Stapp was a visionary. He could see that we were going to keep on going higher and faster and that eventually, we would reach space. And he wanted to be sure that when we did finally cross that threshold, we would be ready. Craig Ryan, Writer: All his life he had watched the advances that mankind had made and he complained all the time about the fact that we're always underestimating man, he said mankind can do amazing things if we will just believe in it and, and do the hard work necessary to make it possible. Narrator: For his next experiment, Stapp wanted to study a person in space-- or at least as close as he could get. For this, he would now turn to the oldest aerial vehicle known to man. 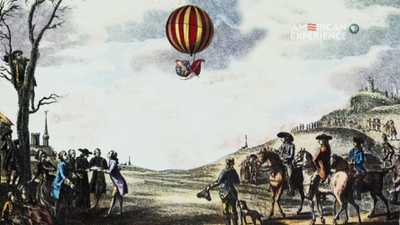 In 1783, the first hot air balloon lifted a menagerie of farm animals several hundred feet above the palace of Versailles, amazing Louis XVI and his court of onlookers. Later that year, Frenchman Jacques Charles became one of the first humans to view the world from the air. "Such utter calm. Such an astonishing view," he recounted. "Seeing all these wonders, what fool could wish to hold back the progress of science?" 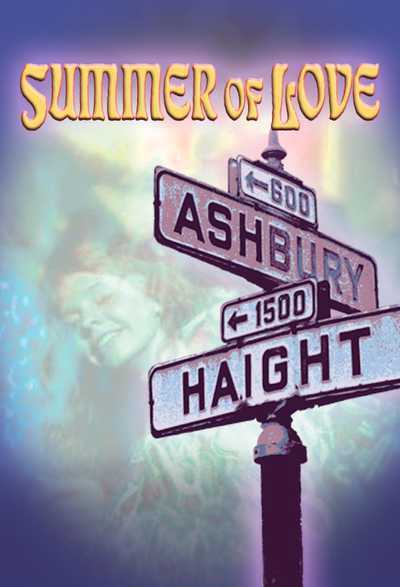 Richard Holmes, Writer: No one knew what it was like up there, no one had been up there. If a balloon went into a cloud, would everybody be electrocuted? What would happen as you got nearer the sun? How high can we go? Narrator: Throughout the 18th and early 19th century, bigger and better balloons lifted adventurers higher and higher into the sky, sending them to heights beyond 20,000 feet. Then, in 1862, a British meteorologist and his pilot unwittingly ventured above 30,000 feet and discovered, to their horror, the limit of earth's hospitable atmosphere. Richard Holmes, Writer: There's a famous lithograph which shows, uh, Coxwell and Glaisher at seven miles, with Coxwell in the hoop, tilting backwards and Glaisher slumped against the basket. They were suffering from oxygen deprivation which first of all effects your sight and then your muscular strength. Narrator: They managed to descend in the nick of time. A new frontier had been discovered. Far from deterring aerial explorers, this forbidding death zone would lure them farther and farther into the clouds. Burkhard Bilger, Writer: It's an ancient human urge, to go as high up as you can. Just simply to touch the sky, that's, it's one of those primal urges. Human beings had spent their entire evolution confined to the surface of the earth. And suddenly we have this three-dimensional space opening up above us. Gregory Kennedy, Aerospace Historian: We live in the troposphere, which is the layer of the atmosphere closest to the earth's surface. It's where there's enough atmospheric pressure, enough oxygen to sustain life. It goes up to an altitude of about 35,000 feet. The next layer up is the stratosphere. Craig Ryan, Writer: The stratosphere was really the new frontier. We knew that the air was very thin, we knew it was very very cold, but we didn't know much else. The balloonists were the first ones that went up there and exposed themselves to those conditions. Narrator: In 1931, sealed inside an innovative pressurized and oxygenated gondola, Swiss physicist Auguste Piccard rose to over 51,000 feet, marking the first successful foray into the stratosphere. Then in 1933, the Soviets claimed they had exceeded 60,000 feet in their first high altitude balloon. Within a year, the United States Army Air Corps and the National Geographic Society announced "Project Explorer," a joint venture that hoped to send three Army officers to a record 75,000 feet. Craig Ryan, Writer: It was conceived partly for scientific reasons, but also because we were in -- even though it wasn't being called this yet -- a space race with the Russians. And the way the score was kept was altitude records. Narrator: The balloon alone weighed in at over 5,000 pounds. Two and a half acres of cotton fabric had to be glued together using three hundred gallons of rubber cement. The massive contraption was assembled on site in South Dakota by more than a hundred troops from a nearby Army base. Three million cubic feet of hydrogen gas, pumped through canvas tubes, was needed to lift the gondola, the three men, and over a ton of scientific equipment. Craig Ryan, Writer: One of the big issues they wanted to solve was the problem of cosmic rays. When you get above the troposphere you are exposed to very strong particles of radiation coming from outer space. They thought of them as cosmic bullets. When they hit the earth's atmosphere they diffuse. But if you're gonna be in the stratosphere for extended periods of time, they didn't really know how dangerous that was going to be. Francis French, Aerospace Historian: They thought cosmic rays might make people sterile. They might go into their eyes and make them blind. They might affect their brain. There were many, many theories along those lines. Narrator: On July 28, 1934, Explorer lifted off. Americans were captivated by a live radio broadcast of the event. 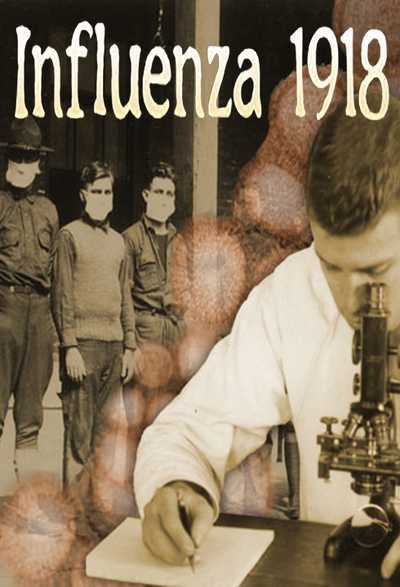 Radio Broadcast (Archival): The year's greatest scientific air adventure. For the glory of the Army!, and the study of the mysterious cosmic rays, they risk their lives exploring the stratosphere. Gregory Kennedy, Aerospace Historian : They were almost within range of setting an altitude record when the balloon started to rip. The bottom fell out of the balloon and then it became kind of a hydrogen filled parachute. Narrator: As the hole widened, they picked up speed. Plummeting towards earth, it was clear the men would have no choice but to bail out. Then at only five thousand feet, the balloon burst into flames. Craig Ryan, Writer : The pilots aboard were actually very lucky, they were able to crawl out and parachute safely. 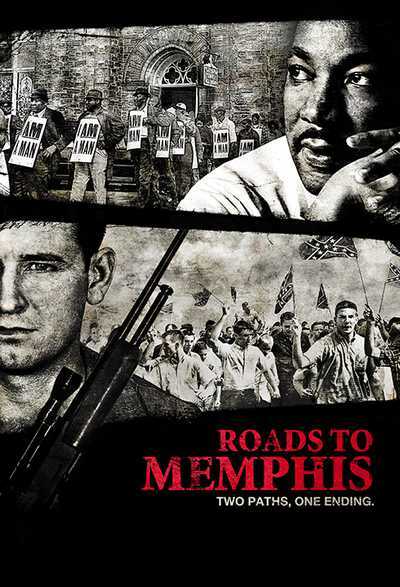 It couldn't have gone any worse unless they had been killed. Francis French, Aerospace Historian: The Explorer Project balloonists were pushing the technology to the absolute limit and in many ways beyond what was safe at the time. But America wants to get an altitude record. It's a matter of national prestige. Narrator: Within a year, a sizeable insurance claim allowed the balloonists to rise again aboard Explorer II, the first balloon to use helium as a lifting gas. Gregory Kennedy, Aerospace Historian : Helium doesn't burn, so it's much safer. But it doesn't give you quite as much lift as hydrogen does, so you had to have a larger balloon. They also reduced the crew size to two so the capsule was lighter. Narrator: With dawn breaking, Army Air Corps Captain Albert Stevens and First Lieutenant Orvil Anderson set off to finally perform their experiments in the stratosphere. Gregory Kennedy, Aerospace Historian : They collected spores, they did radiation measurements. They took samples of the atmosphere. There was a whole agenda of science experiments they did during the flight. Narrator: The Explorer II balloonists reached an unprecedented 72,400 feet and after eight hours in flight, they landed safely in a field and received a hero's welcome. Craig Ryan, Writer : They were really up there. And, uh, it took a lot of guts, it took a lot of knowhow and it took a lot of problem solving ability to get up there and then get back down safely. Narrator: A cloth balloon, stuck together with rubber cement, had set a new world record, but the technology of the day had reached its limit. Only a revolution in design would allow explorers to continue their ascent towards space. Television Commercial (Archival): This is a polyethylene plastic film. We find it wrapped around fruits and vegetables at the grocery market. And it has many other uses. It seems quite flimsy, but it is really quite strong. And it will hold air or helium -- (man blows into bag and then tries to pop it). Narrator: By the mid 1950s, John Paul Stapp was watching the latest in balloon technology take flight at his Aeromedical Field Laboratory at Holloman Air Force Base. He seized upon these aerial platforms for his space research. Francis French, Aerospace Historian: Balloons were very useful because you can get something into near space and then leave it there for a while. If you're sending something up as high as a 100,000 feet in an airplane or a rocket, it'll only be up there for minutes if not seconds. A balloon can be up there for many, many hours, do a lot of tests, come down gently. So balloons were a very good way of doing many of these experiments. Narrator: Dr. David Simons, a lead researcher at Holloman, had been sending a variety of instruments and animals to altitudes over 100,000 feet. Craig Ryan, Writer : Simons was taking all kinds of measurements with devices they'd sent up. But the mice and hamsters couldn't report back on what happened to them up there. As Stapp said, all they do is sit there and defecate. He said, what we really need is a human being aboard one of these flights so that we can, get observations, and so he asked Simons, "Do you think we could put a person into one of your gondolas and send them up to, 100,000 feet and then bring em back down alive?" And Simons thought about it awhile, did some calculations and said, "I don't see any reason why it wouldn't be possible." Narrator: They devised a plan to send David Simons himself high into the stratosphere to gather data on "human factors of spaceflight." But the necessity of studying a man in space would be a tough sell to Stapp's Air Force superiors. Francis French, Aerospace Historian: In the mid-1950's, if you were in the Air Force, it was almost career suicide if you mentioned space. Space travel was seen as science fiction comic book, kid's stuff. Mike Smith, Aerospace Engineer : The ability to put something into space didn't even exist yet. There wasn't one single thing orbiting the earth but the moon. Gregory Kennedy, Aerospace Historian : High altitude rocketry was still in its infancy so manned space flight was not regarded as a respectable endeavor. Col. Joseph Kittinger, United States Air Force: There wasn't a piece of the pie for space research. Dr. Stapp's challenge was to get the funding to do the project. And he was going to get it done one way or the other. Narrator: After months of negotiations, Stapp's perseverance paid off. In the spring of 1956, "Project Manhigh" was approved with a modest budget. Mike Smith, Aerospace Engineer : Manhigh was very specifically, Aeromedical research. 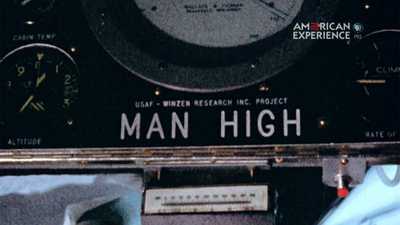 The Manhigh Project, they saw as the true stepping stone to space. Narrator: The first order of business was to build a balloon big enough, and light enough, to take a man and a capsule, filled with hundreds of pounds of scientific equipment, beyond 100,000 feet. Stapp and Simons turned to one the nation's premiere balloon manufacturers, Winzen Research, in Minneapolis. Otto Winzen's silvery creations had been ascending with Simons' lab animals for nearly four years now. His corporation also supplied balloons for a series of programs run by the Navy, but Manhigh would be their biggest project by far. Craig Ryan, Writer : Otto Winzen was a brilliant guy, but he wasn't a business man. And so what it really took to run a manufacturing facility like Winzen Research was someone who could manage the facility, manage the personnel and that's where his wife Vera Winzen came in. She actually pioneered a lot of the processes that allowed them to build bigger and bigger and better and better balloons. Mike Smith, Aerospace Engineer : The balloons were laid out on very long, thin tables. They would lay out one section of the balloon and run a heat sealer down one edge, going down the table. Lay the, uh, seal back, dispense another layer of film, run a seal until they run the closing seal and then fold it up and put it in a box. Craig Ryan, Writer : Because that polyethylene was so thin, they had to be extremely careful about how they worked with it. The Winzen's called them their "balloon girls," they worked in stocking feet and they would check their finger nails every morning to make sure there wasn't a hang nail. Mike Smith, Aerospace Engineer : Vera wanted to make sure that she got the best craftsmanship and made sure that everybody cared about making these balloons perfect. Narrator: By the fall of 1956, the first of many balloons had been completed, and work on David Simons' capsule was well underway. The project was woefully underfunded, but Stapp and his team were masters of improvisation. Craig Ryan, Writer : The Manhigh gondola really did look like something that your crazy uncle built in the garage. It was about the size of a telephone booth. A man could not stand up inside the capsule. And it needed to be that small because, the heavier the payload is, the bigger a balloon you need. So you needed a pretty small capsule to make all of this work. Burkhard Bilger, Writer: These guys, they're really kind of cowboys. They're working on the fringes of the military throwing together spare parts in incredibly smart, practical ways. They accomplished a huge amount in a fairly short amount of time. Narrator: Prior to sending Simons into the stratosphere, Stapp wanted a trial run with an experienced aviator in control. Captain Joseph Kittinger was the obvious choice. Col. Joseph Kittinger, United States Air Force: David Simons was a very serious scientist, but he was not a test pilot. And Dr. Stapp knew that he needed somebody that knew how to operate in an emergency. There's a lot of potential things that could go wrong. I spent days in my pressure suit, going over every inch of that capsule, going through the procedures. And I had complete confidence in the equipment and in myself. This was gonna be just another test flight for me. Narrator: Space officially begins 62 miles, or 327,000 feet above earth. Francis French, Aerospace Historian: Space is very, very close. We could drive there in an hour if we had a car that could go straight up. But you don't have to get up into space to essentially experience the conditions of space. Mike Smith, Aerospace Engineer : At 100,000 feet, you're above 99 percent of the earth's atmosphere. You have almost no pressure and there is basically no oxygen. There is extreme heat during the day, extreme cold at night so you have almost all of the same conditions, that you have in space except for the weightlessness. If something goes wrong, you're dead. Francis French, Aerospace Historian: There was a psychological danger as well. A lot of doctors thought that being that high in the atmosphere might do very strange things to a person's mind. A lot of questions wouldn't be answered until the person went into space or into the upper atmosphere. Craig Ryan, Writer : Although some Air Force pilots had arced briefly above 100,000 feet, it was just a quick shot. The Manhigh Project would be the first mission to send somebody up and expose them to those conditions for a significant amount of time. Narrator: In the early hours of June 2, 1957, Captain Joseph Kittinger was ready for his voyage to the threshold of space. 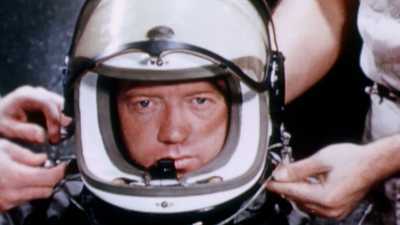 Col. Joseph Kittinger, United States Air Force: I went into the capsule with my pressure suit on. They sealed the capsule up, completely, airtight. 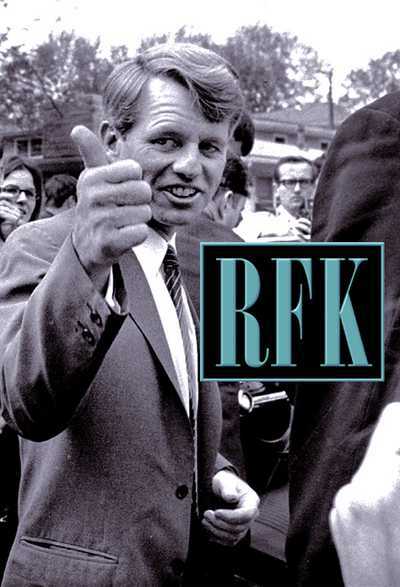 And put me on back of a pickup truck and we drove twelve miles to the airfield at South St. Paul, Minnesota. Dr. Stapp, of course, was there and Simons, and I'm ready to go. Narrator: By first light, the Winzen Research crew had preparations well under way. With the balloon nearly inflated, the capsule, now wrapped in several layers of Mylar insulation, was rolled into position. Otto Winzen gave it one final inspection. Burkhard Bilger, Writer: There's something absolutely wonderful and dramatic about a balloon. This device that's both this huge feat of human engineering, but is also still completely at the mercy of the atmosphere. Mike Smith, Aerospace Engineer : It's scary and beautiful at the same time. You have all these loose folds of material hanging down from this little bubble of helium in the top. The higher you go, as the atmospheric pressure goes down, that bubble of helium expands and completely inflates the balloon. It always amazes me. Col. Joseph Kittinger, United States Air Force: I went up at about 800 feet per minute. And when I went through 72,000 feet, I gave a salute to Anderson and Stevens, because I was now beating their record that had been there since 1935. I was just amazed at how beautiful it was. The transition from the blue at the horizon to the dark sky overhead. It's absolutely black in the middle of the day. Pretty close to 90,000 feet I realized that my oxygen system was not working quite right. Craig Ryan, Writer : As the balloon got up to 96,000 feet, it was beginning to get dire. It was really a mystery, why was the oxygen supply being depleted so fast and why were the carbon dioxide levels rising? Col. Joseph Kittinger, United States Air Force: I knew that I was going to be low on oxygen. So I started letting the gas out of the balloon so I can come down. And I had to be very, very careful because if I let out too much I would come down too fast and it would be dangerous for landing. Craig Ryan, Writer : He got back into the troposphere and was able to pop the portholes on the Manhigh gondola, let some fresh air in. He was just about out of oxygen. It was very, very close. He landed in the creek, and Simons and Stapp rushed over to the Manhigh gondola, popped the top off, and Kittinger was sitting inside with a big grin on his face. Narrator: Manhigh I established an altitude record of 96,784 feet. Joseph Kittinger had been higher than any man had ever been in a balloon. Craig Ryan, Writer : It turned out to have been in some ways a disastrous flight. 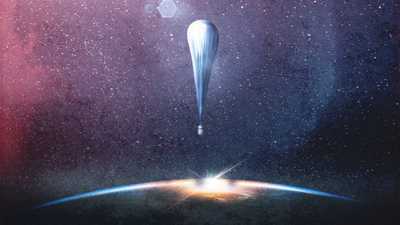 They discovered that an oxygen valve had been installed backwards and that they had been venting their oxygen supply to the outside atmosphere rather than into the capsule. The radio failed. All kinds of things went wrong. And you would think, total disaster. But, in John Paul Stapp's mind, it was a perfect test flight, because in his mind that's exactly what a test flight is for. Let's find the problems, let's fix 'em. Narrator: Only a few weeks after Kittinger's test flight, David Simons was finally getting ready for the project's true mission. He would travel to the fringes of the earth's atmosphere for a full 24 hours, measuring his own physical and psychological endurance in what he called, "the greater cosmic wilderness" of space. But in the summer of 1957, as the launch date approached, Project Manhigh hit a new obstacle. Congress slashed funding to all military research and development. The project was already nearly ten times over budget and Stapp had been raiding other programs to cover the expenses. Now, Project Manhigh would have to be shut down. Francis French, Aerospace Historian: The trouble with the Manhigh program in many ways was that the people who were running it were really the only people that knew how successful it was. And it was very, very hard to persuade other people to understand that what they were doing was important. Dana Kilanowski, Aviation Historian: The Air Force priority was not space. So the Manhigh budget was a shoestring budget. And Dr. Stapp was always very innovative in getting more money and more equipment. But there were limits to what even he could accomplish. Narrator: Just as Stapp and Simons were about to admit defeat, Otto Winzen announced that he and Vera would step in to cover the shortfall. The project was back on. As Simons would later recount, "I was as happy as a five-year-old on Christmas Day." Francis French, Aerospace Historian: Simons was a scientist who had a great personal stake in the mission he was about to undertake. Unlike some of the astronauts that came later, who would be essentially doing somebody else's experiments, Manhigh II was going to be the culmination of Simons' career. Narrator: In preparation for his launch, Simons did one final check of the capsule, including the electrical control panel and a new and improved air supply system. Craig Ryan, Writer : Stapp said the goal of putting David Simons up there was to find out, can he survive? And can he do useful work in that environment? They even taped a piece of photographic film to David Simons' forearm so that they could track where the cosmic rays impacted his body. You don't want to say he was a guinea pig, but he was the closest thing to that as he sat there sealed inside that capsule getting ready to launch. Narrator: Finally, in the early hours of August 19th, Simons was transported to the launch site, an open-pit iron-mine, two hours north of Minneapolis. Mike Smith, Aerospace Engineer : I never get tired of seeing a launch. You, you think of how thin this material is, how much the balloon itself weighs, how much the payload weighs and how much lift is in that balloon. Not like a rocket with a bunch of fire and noise, it's something completely unique. And, uh, beautiful. Narrator: A mobile command center allowed Stapp and Winzen to keep in contact with Simons throughout the flight. Otto Winzen (Archival Audio): Dave, what is your rate of ascent now? David Simons (Archival Audio): Well, we're still under 1,100 now, Otto. Otto Winzen (Archival Audio): Roger, thank you. What do you read now, Dave? Over. David Simons (Archival Audio): 27,300. Otto Winzen (Archival Audio): Very fine, Dave. Capsule pressure should be holding now. You're past 25,000, is that Roger? Over. David Simons (Archival Audio) : Aye, roger. Otto Winzen (Archival Audio) : I think we should try to maintain the altitude as we previously discussed. David Simons (Archival Audio) : Aye, roger, it's a lovely sight. Narrator: As the balloon leveled off above 101,000 feet, Simons focused on his regiment of over 25 experiments and observations. Francis French, Aerospace Historian: He's looking at radiation meters, looking at pressure meters, looking at his respiration, his perspiration. He can describe what it's like personally and tell the people on the ground exactly what's happening to him. Otto Winzen (Archival Audio) : Dave, as far as we're concerned, things are going so well that I see no reason why you shouldn't stay up during the night. What is your feeling? Over. David Simons (Archival Audio) :: Aye, roger, I agree one hundred percent. Otto Winzen (Archival Audio) : So relax a minute and eat another candy bar, would ya? David Simons (Archival Audio) : Aye, roger! Narrator: Simons settled in, radioing back, "I have a ring-side view of the heavens." "Where the atmosphere merged with the colorless blackness of space," he later recalled, "the sky was so heavily saturated with this blue-purple color, that it was hard to comprehend, like a musical note which is beautifully vibrant, but so high that it lies almost beyond the ear's ability to hear, leaving you certain of its brilliance but unsure whether you actually heard it or dreamed of its beauty." Ken Hollings, Writer : The most beautiful descriptions come from the balloonists who are that high up and they can suddenly see this other universe, this dark, empty, fascinating, glittering universe. Burkhard Bilger, Writer: The willingness to put yourself in extreme danger simply to satisfy your curiosity is one of the oldest human impulses. You know, there weren't new continents to explore, but there was this place right above us. And we were able to exert that human impulse to get there. Narrator: After 32 hours aloft, David Simons returned to Earth. The Manhigh team had made history on the edge of space. Simons was put on the cover of Life magazine and The New York Times celebrated him as "The First Space Man." 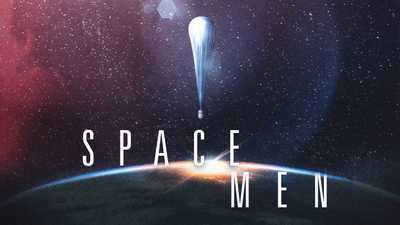 Craig Ryan, Writer : Everybody connected with the project, including John Paul Stapp thought that this was going to be the mission that brought space research into the fore with the Air Force and really got them the respect and the funding that they thought they deserved. What happened in fact was, in spite of the celebrity that David Simons experienced, they had pretty much exhausted their funding. And they did not have enough money even to do the full analysis of the data they'd gathered on the flight, much less begin seriously talking about another flight. Douglas Edwards, CBS (Archival) : Until two days ago, that sound had never been heard on this earth. Suddenly it has become as much a part of 20th century life as the whir of your vacuum cleaner. Ken Hollings, Writer : On October the 4, 1957, the soviets announce, "Hey, guess what, we've got sputnik orbiting the earth and you don't." For Americans, it is genuine shock. Narrator: For a decade, the Americans and the Soviets had been vying for geopolitical dominance. Now, Sputnik had caught the United States completely off-guard. Almost overnight, putting a man in space became a national priority. Col. Joseph Kittinger, United States Air Force: Suddenly people were more interested in what we were doing. Dr. Stapp was now not looked at as a mad scientist but as a man of, of, vision. Craig Ryan, Writer : Very, very quickly Manhigh III planning began. And now this wasn't just gonna be a scientific research flight. This was now seen as the prototype for spaceflight. Narrator: Candidates for Manhigh III were put through a rigorous gauntlet of tests that would become the basis for qualifying future astronauts. Francis French, Aerospace Historian: They were trying to eliminate anybody who had even the slightest medical or psychological flaw. They would be put in isolation chambers, not knowing how long they would be in there. They were subjected to intense cold, intense heat. They were rotated, spun and tumbled every possible way and asked to do technical work. It was a very, very grueling selection process. Narrator: By September of 1958, Manhigh III had it's man, a 26-year-old Air Force pilot with a masters degree in engineering, named Clifton McClure. Three weeks later, Manhigh III took flight and McClure was put to his ultimate test. As he rose into the stratosphere, his capsule began to overheat. Gregory Kennedy, Aerospace Historian : At almost 100,000 feet, they notice his voice is getting kind of sluggish. So they ask him to report his body temperature. And, it's already a 104.1. So the decision was made -- bring him down. Narrator: During the descent, a radio malfunction led the ground crew to believe that McClure was unconscious. After two harrowing hours, the capsule landed within a few miles of the launch site. Craig Ryan, Writer : They ran to the gondola, and McClure was pulling his helmet off and grinning. They took his temperature -- it was more than a 108 degrees. Nobody could believe that the man was still conscious. Narrator: Clifton McClure had turned out to be the ideal astronaut prototype -- the very definition of what would come to be known as, "The Right Stuff." But by the time his heroic mission was complete, the tides had turned, once and for all, against Project Manhigh. A week earlier, NASA had started its operations and soon their manned space program, Project Mercury, would be receiving all the public attention and all the government funding. Gregory Kennedy, Aerospace Historian : NASA was given responsibility for manned space flight. The Air Force was told to get out of that business. Narrator: The new space agency asked John Paul Stapp for his assistance in selecting their first astronauts. Stapp agreed, and used his regimen of physical and psychological tests to help reduce the pool of 69 candidates down to the world famous Mercury Seven. Clifton McClure was turned down by the Mercury program because he was too tall. Craig Ryan, Writer : It was tough for the men and women who had been involved with Project Manhigh to see all of their, their glory stolen by, by NASA and the rocket program. They were not allowed to bask in the glory that the Mercury astronauts were able to experience. Narrator: By the summer of 1960, John Paul Stapp was back at work with the Air Force on one last high-altitude balloon experiment. He named it Project Excelsior, Latin for "ever upward," and once again, put Joseph Kittinger at the helm. Craig Ryan, Writer : For Stapp, there was one problem that hadn't been solved yet and that was the problem of emergency escape. What if a high altitude pilot or an astronaut needs to get out of the vehicle? How do you get them from the upper stratosphere and back into a warm breathable atmosphere in a reasonable amount of time? Col. Joseph Kittinger, United States Air Force: If a man opened his parachute at 100,000 feet and it takes him 30, 40 minutes to get down, he'd be dead. The challenge is to get from 100,000 feet down to 20,000 feet before you can open the parachute. Craig Ryan, Writer : They knew that the human body, falling through the upper atmosphere, tends to go in what's called a flat spin. Like a record album on a platter, faster and faster until the pilot would pass out. What they needed was to test a new kind of multi-stage parachute, which would keep you in a stable attitude until you got down to where you could open a traditional parachute and fall the rest of the way. That was Kittinger's mission. 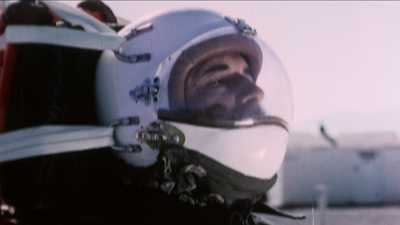 Narrator: After 90 minutes in flight, Kittinger leveled off at 102,800 feet, breaking the altitude record set by David Simons three years earlier. Col. Joseph Kittinger, United States Air Force: So I'm there and I'm standing up and I'm looking up at the horizon. I have this phenomenal, beautiful view. I stood there for four or five seconds absorbing the situation I was in. And then I said a prayer and I jumped. Ken Hollings, Writer : The image of, of, Kittinger falling through space -- this tiny speck high above the earth. It's amazing. He's between these different worlds. Burkhard Bilger, Writer: When you're that high above the earth, there's no sound, there's no wind, there's nothing you feel. He's just falling silently through this void. Craig Ryan, Writer : The parachute worked exactly as planned. He began to gradually slow down as the air thickened around him. And he got to about 17,000 feet, where he pulled the ripcord on his main parachute, it opened and he knew that he was gonna make it. Francis French, Aerospace Historian: There's always been a drive to go further and higher, but in this case the overwhelming drive was to make people safe. It wasn't a quest for glory, it was a quest for knowledge and there's something even more beautiful about that. Narrator: By the time Kittinger touched down, he had survived the longest free fall and the longest parachute jump ever, nearly 20 miles in a total of 13 minutes and 45 seconds. He was hailed as a national hero, in a final tribute to the original space men. Col. Joseph Kittinger, United States Air Force: What we did on Manhigh and Excelsior were, were, just small, incremental bits of knowledge that were made possible by a team of people that were working and dedicating their lives for the future of the space program. Francis French, Aerospace Historian: Sending people into the upper atmosphere on a large balloon doesn't seem as incredible as leaving footsteps on the moon. But America may not have gotten to the moon if it wasn't for pioneers like Stapp and Kittinger and Simons asking the questions that needed to be answered before we could get on with the business of flying in space. Mike Smith, Aerospace Engineer : This was a good example of what a very small group of very dedicated, very focused people can do out of sheer will. Richard Holmes, Writer: There is an absolute link from Icarus to the balloon to rockets. They are all part of one long stairway to the stars. Before the days of NASA, scientists and researchers at the U.S. Air Force were testing the limits of how high man could fly.